Our weekend has been pretty much about finding our Kien - the spirited personality that dwells inside a feisty 19 month old. He is generally an independent fellow and doesn't need a lot from us when he is in the zone. We've seen Kien's boisterous self come out to play a few times, but mostly he has been reserved and needy. Parenting is especially hard when the child doesn't want to do his own thing at all and would rather be stuck to you like glue - which was pretty much what happened. But you know what? When he's back his smile lights up the whole room - or in this case his whole cot as he was getting ready for sleep time last night. You know what else? He slept all the way through from 7pm (and he asked to go to bed) until 7am. It's been a week now of him sleeping through. It is wonderful! I hope I haven't jinxed it by saying anything (even though I don't believe in such hog-wash). This morning we were out the door early and went to the markets to buy produce. We then went to a winter festival out in Botany Town Centre. The lack of any pictures explains my disappointment and disgust in this non event. The organisers should be ashamed of themselves for even using the term "winter festival", or putting it on Eventfinder. Anyway, I told Jef I didn't even want to talk about it because it was such a waste of time and didn't deserve another second's thought - so I wasn't even going to write about it but then decided to in case I ever read the words "winter festival" again I'd remind myself to do a lot more research and not to get my hopes up. This is officially the first time he was able to pick something up with chopsticks and put it in his mouth. In the afternoon I was really hoping for some fine weather so we could go to a playground or something. I headed over to the North Shore, and as the rain failed to cease I made the terrible mistake of taking him to Westfield shopping centre in Albany. I absolutely abhor shopping malls, and Westfield is the epitome of why I don't ever venture into them! Half an hour of walking around a myriad of sameness I was completely done with the experience, and so was Kien. He kept saying "outside" and pointing at doors. So we escaped, but not before I stole a balloon on a stick for him. He really wanted it, and instead of trying to reason with him in amongst the herd/horde I just gave it to him so we could get out of there. Kien with his "hot" item. If you haven't noticed look closer - it's a double! 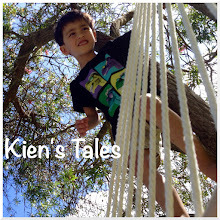 Once we hit the sand Kien was back! He had a great time attempting to throw sand into the water. He ran into the water a few times; I think when the waves rushed in it took him by surprise. His feet however did not get wet thanks to having his cool boots on. The boots were purchased at the start of winter - and basically were never worn outside until fairly recently. Why? Because he would want them on and as soon as the second one was on his feet he would kick them both off. He now wears them, yay! As soon as I took the above picture the skies opened up and soaked us in heavy rain. I grabbed Kien and ran to the car but did not manage to avoid being drenched. Tonight in the kitchen Kien was a bartender. He took the jars out of one of the bottom drawers, put the lids on them (I store lids separately), and lined them up on the makeshift gate. Now all I need to do is show him how to mix a cocktail and we are good to go!